Before you read my review of Merit Gold, click here to see why I decided to work with this other company instead. 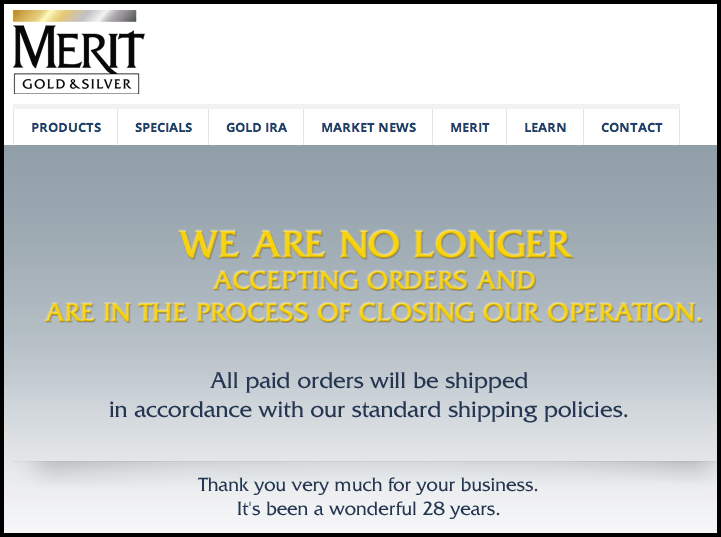 Merit Gold & Silver Has Officially Closed Its Business. Probably as a repercussion of and pursuant to an initial consumer protection lawsuit filed against Merit Gold & Silver by the Santa Monica City’s Attorney’s Office, Merit Gold has now announced on their website that they will no longer be taking orders and that they will start closing their operation (image from their website, below). This goes to show that this industry is filled with traps and tricks, and with companies out to scam first time buyers. Be VERY careful about the Gold IRA Company you decide to work with. So you can reference Merit Gold & Silver’s past history, I’m still including my review on this company, below. Merit Gold, also known as Merit Financial, has served more than 250,000 clients in the last 27 years and continues to offer valuable assistance to customers, each and every day. The precious metals industry is a very turbulent one and has seen many companies rise and fall. Despite of this, Merit Financial has been able to remain resilient and continue to be a strong partner for people who want to make the most of their precious metals investments. This can be attributed to the company’s aggressive and transparent pricing policies and insightful and sensible market surveys. Merit Financial scores a perfect rating with both TrustLink and the Business Consumer Alliance, it is very well established, and has some rave reviews from clients. However, Merit Gold is not accredited with the Better Business Bureau, and it has received numerous complaints with the BCA, the Ripoff Report, and Yelp. The overall feel from unsatisfied clients is that their delivery is slow, their salespeople are sometimes pushy or provide misrepresented information, they charge high commission fees, and some of their products are priced higher than the competition. Merit Financial is not accredited and currently does not have a rating with the BBB. The Business Consumer Alliance has given a AAA (highest) rating to Merit Gold. However, there have been 67 complaints filed against Merit Financial in the last 3 years. Most of the complaints appear to be about very slow delivery. Some other complaints state that the purchased goods were overvalued during the sale process, resulting in realizing they had less value upon arrival. Merit Financial has received a 5 star (highest) score from TrustLink. The grand majority of reviews are very positive. However, there are a few cases where clients have left bad reviews – most of these involve Merit Financial not delivering shipment in time or not delivering at all. – Ripoff Report: There are 12 complaints filed against Merit Financial with the Ripoff Report. Most of the complaints have to do with: slow delivery, deceptive sales tactics, overvalued goods during sales process and undervalued goods upon arrival, and no response to orders made online. – Yelp: Merit Financial scores 1.5 stars out of 5 on Yelp. One reviewer states that the company pays no attention to online orders. Another reviewer explains that Merit Financial charges excessive commission fees, resulting in a much reduced balance out of the purchased goods. – ComplaintsBoard: There have been a few complaints filed against Merit Gold with the ComplaintsBoard, most of them involving delivery of incorrect goods (the coins ordered by the client were different), and pushy salespeople that misrepresented the pricing and put in a different order vs. what the client really wanted. Merit Financial offers packages for all precious metals: gold, silver, palladium and platinum. These products come in various forms, quantities and values. This enables all clients to invest in precious metals despite their preferences or the amount of money they have. Gold is one of the most common and popular precious metals. There are several forms of gold that Merit Financial accepts and offers. Some of them include gold bars, bullion, American Eagle coins, American Buffalo coins, South African Krugerrand, Australian Kangaroo and British Sovereign coins among many others. Merit Financial also deals with several forms of silver. Some of them include the Canadian Maple Leaf coin, Silver bars, Silver American Eagle, and Silver Commemorative dollar. Just like gold, these various forms of silver are sold at various price points. Platinum is one of the recently discovered and rare precious metals. It is very valuable and fetches a higher price than gold, due to its scarcity. Merit Financial currently deals with only one form of platinum — the 1 ounce platinum bar. The last precious metal is palladium. Merit Financial offers this metal in two investment forms: the palladium 10 ounce bar, and the palladium Canadian maple leaf. For the reasons above, I decided to not choose Merit Gold.